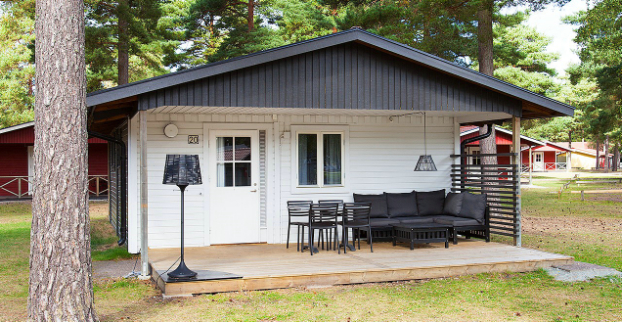 KronoCamping Böda Sand is one of Sweden’s most complete holiday facilities. It is located on a long, child-friendly beach. Paradise for families with children with sauna, spa, fun shower, play land, swimming and lots of children’s facilities. Choose from camping pitches, cottages in many different sizes, “love nest”, tents or mobile homes. There is an ICA, bakery, café, shops, fast food stall, and one fully licensed restaurant. 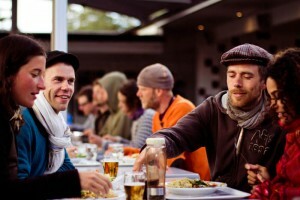 The fee for tents and trailers is normally 225kr per tent during low season. We have a special festival price of 150kr per day for those who live in tent. This price is for 1 person up to max 4 persons on the same camping spot. If you want an electrical hook-up you pay 40kr extra/day. There is a well-stocked ICA supermarket located in the center of the campground. The campground has nice cooking facilities if you want to make your own food but please note there are no pots and pans or any kitchenware provided in these kitchens. The cottages all come with cooking ware. The restaurant Beach Club is beautifully located right near the shore. They offer a complete lunch and dinner menu, and a reasonably priced salad buffet, Öland’s specialties and high quality à la carte. The bakery, open from 8 A.M, serves breakfast with a choice of smoothies, sandwiches, yogurt, muesli, juice, coffee and tea. The eggs are organic as well as most sorts of flour and seeds used in the breads. You can also buy fresh bread and crackers and have a picnic. It is possible to order vegan and gluten-free breads and sandwiches. New for 2018 is also Foodmarket, a street kitchen. Foodmarket will have regular street food and a deli where you can buy salads, fruit cups, sandwiches, etc. 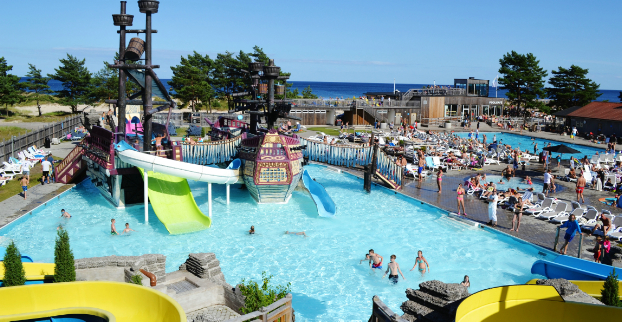 Everyone living at Böda Sand campground is given a special rate of 80kr per day for the adventure pool. The pool includes an entire play center with slides of various sizes, a pirate ship with water cannons and more. There is also a sauna and in the area there are many playgrounds and trampolines.